One of the simplest things you can do to be a better writer is to read. Especially within your genre. But, it’s not enough to simply read, you have to read consciously to learn what makes a book great, mediocre, or bad. And, that means you have to dissect the plot, characters, scene, and writing styles. 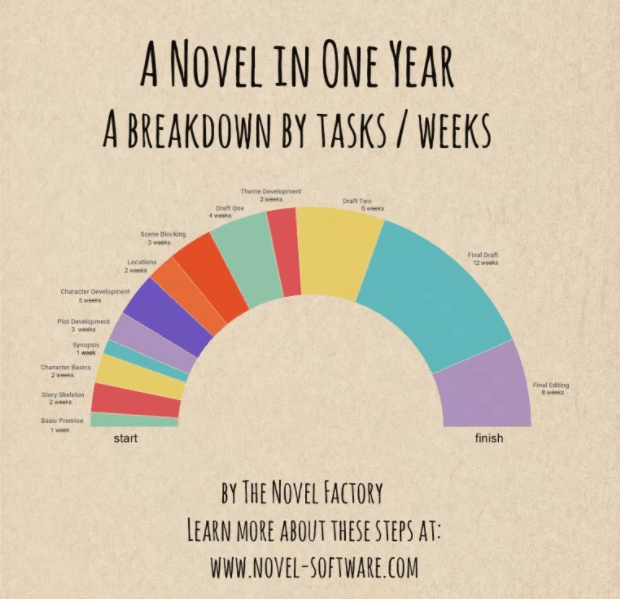 The infographic above shows all the tasks you have to accomplish to write a book in one year. But, in a very real way, everything you do contributes to making that book everything it can be. For some, it’s taking classes or even getting a degree in writing. One of the members of my book club has an MFA in writing and I consistently find insights she shares from her classes valuable. For instance, last night she talked about ABCDE–action, background, conflict/climax, resolution (denouncement) and ending. While I’d never heard of it before, it certainly makes a lot of sense. For others, it means thoughtful outlines, character studies, plot arcs, and a lot of prewriting, as shown in the graphic below. For me, my effort to be a better writer comes from carefully reading both examples of great books and those that fall short. When I used to teach a PhD class on research and publishing, I would ask students to outline a paper I felt represented a good example of the kind of research we do in marketing. I then asked them to fit their paper into that outline and to finally write their paper from the outline. This ensured they followed “best practices” when it came to writing a research paper. Currently, I’m reading The Butterfly Garden, which has been on the Amazon bestseller list for ages. I have discovered, my to my dismay, that being a bestseller doesn’t always mean the book is good, but, in this case, it’s true. What can you learn about writing from reading this book? Background– it’s often difficult to get background into your story, even when it’s critical for the story arc. This book does it very nicely. During the interrogation of one of the Butterflies, FBI agents probe her background which brings in this element very natively. There’s a dialog where the Butterfly answers the question, then a section where she takes over the narration to expound on her background with little mini-stories. Suspense– I’ve read writers who really fail at creating suspense either by not giving the reader anything, which slowly builds suspense. However, after taking 300-400 pages to create suspense, the resolution has to be logical, given the hints, and BIG. I once read a book, the only one I’ve ever given a negative review, which did this and then never resolved the conflict–holding off for the next book, I guess. In The Butterfly Garden, we know that something catastrophic has occurred to the garden, we just don’t know what it was. As the reader becomes more curious as to what transpired, we curtain over life in the garden slowly emerges, bringing with it its own revelations, which both builds suspense, but also provides answers to questions we didn’t even know we had. Characters– A book is not worth reading if we don’t care about the characters. Sometimes that means getting into the character’s head. In other cases, we need to see the character’s personality through their actions. In this book, the characters are pretty underdeveloped, except for the women in the garden and the gardener, himself. But, then, the book really isn’t about the FBI or the interrogation. It’s about what’s happened in the garden. Hence, all the true action took place before the beginning of the book and Maya is simply the storyteller who reveals what happened to them there. Overall, I highly recommend this book to writers who wish to be a better writer. So, things are moving at a brisk pace. In addition to attending the Scars of the Past Launch party, we have lots of exciting things going on. Azure’s Revenge, the 3rd book in the Dark Web series, published on Black Friday. You’ll get to see many of your old friends from Books 1 and 2, and meet some quirky (and sinister) new ones. I’d love to get more readers and reviews for this book. Book 4, which is currently untitled, is well underway. It carries on the tradition of having the FBI cyber unit work to save the country from death and destruction. If you’d like to read some of this, simply subscribe or check out this page for the latest chapters released.